Thank you very much. Zapboy-san, your feedback is much appreciated. Zapboy (1 year ago) Inappropriate? Tom (2 years ago) Inappropriate? Thank you. JeffersonAF san, I'd like to see your Bryce 7 Arts. pamac san, Thank you for your comment. I like your genreless works except for sci-fi. awesome I wish I had done this! Thank you. Bimm san, I like your works which featured the theme of nature. Bimm Florin (3 years ago) Inappropriate? Angie san Thank you very much. I like your cat. Really pretty especially the third image! Hi bioluke san, Thank you for comment. I only added a hand to light of the sun and the bubble brush in Photoshop just a little. The reason why the background of this work is good is that an original photograph of Tomo Yun was superior. He got approved already that I processed his photograph, post and open public. 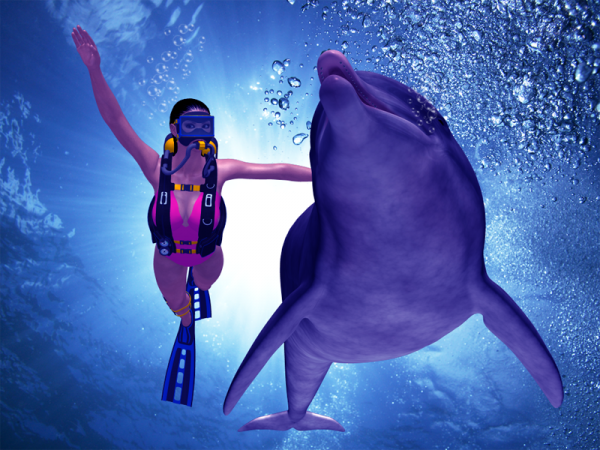 I had no idea there was a DAZ dolphin... love some of the textures at work here, also the water and the bubbles. Hi Elegh san, Thank you very much. I love dolphins like Christian Lassen. 80% of this work, thanks to Tomo Yun, who provided with background photos willingly. I make light of the sun strong in Photoshop and add air bubbles with a brush, But I am no match for real air bubbles and the scenery photographed in Scuba Diving. You met many dolphins in your boat. Enviable. I have watched a genuine dolphin only in an aquarium. Excellent work, well constructed scenarios and ,especially ,very realistic environmental underwater lights, brava. And then I love dolphins, extraordinary animals that I had occasion to see multiple times, at liberty, when I went overboard with my boat. The generation who uses this site, I think that people who do not know this TV series are most. The flipper is best healing. I am very glad for the person of the same generation who was looking at this TV series to be in Italy. I think that marine mammals are fantastic animals, and your works are equally.